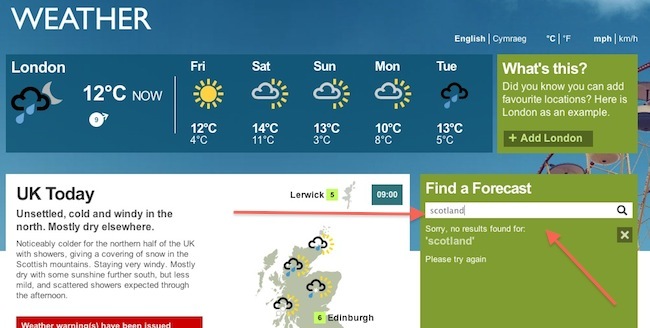 THE BBC Weather site’s Find A Forecast Service allows users to type in the name of a place and discover its weather forecast. A search for Wales produces a good result. 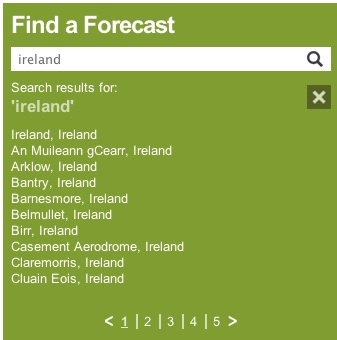 A search for Ireland produces a lot of choices by which to narrow the search. But searches for England and Scotland produce no results. Not one. This is odd. Is it because Wales is bigger than Scotland? No. Wales covers 2,903,085km2; Scotland covers 5,062,011km2. Scotland is about twice the size of the Netherlands, and searching for Dutch weather gives users a choice of 37 locations. England covers an area of 130,410 km2. Nicaragua covers an area of 130,373 km2. 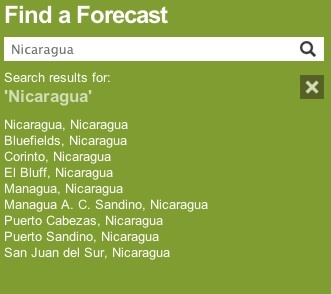 The BBC forecast service gives the Central American country 9 results. Greece covers an area of 131,957 km2. The BBC gives it 56 results.